As a member of the CBIG Childrens' Book Illustrators Group, based in NYC, I will be one of the artists to paint the gallery walls (today, Feb. 16, 2014) in a Collective Participatory Artwork at the New Museum in New York City. This is part of the New Museums's first US Exhibition for Pawel Althamer which features the Artist's Iconic Portraits and Sculpture Workshop. 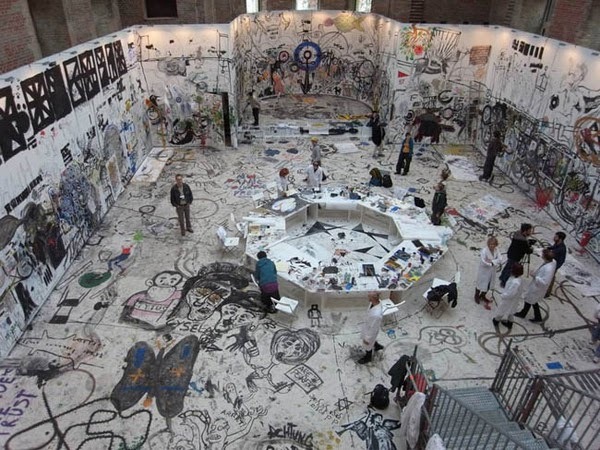 Paweł Althamer, Draftsmen’s Congress, 2010. Exhibition view: 7th Berlin Biennial, 2010. The exhibition will include a new presentation of the artist’s work, Draftsmen’s Congress, originally presented at the 7th Berlin Biennial. During the course of the exhibition, the blank white space of the New Museum’s Fourth Floor gallery will be transformed through the gradual accumulation of drawings and paintings by invited Art organizations, including the CBIG. Found­ed in 1977, the New Museum is a center for exhibitions, information, and documentation about living art­ists from around the world. the New Museum continues to be a place of experimentation and a hub of new art and new ideas.